The six pillars in my mom’s life was prayer, family, friends, travel, shopping and jewelry. Not necessary in that order sometimes. LOL. But seriously no matter what, all her thoughts and actions exuded love and kindness. You can tell from one of her signature pieces she crafted dating back to the 1970’s and finally completed in the mid 1980’s. Most of the charms were from friends or family. Others were purchased from Seymour Rubenstein—her suki (favorite) estate jeweler on 47th Street. As I admire them I’m reminded and inspired by their stories. Some of the trinkets seem to have foreshadowed events that didn’t even occur yet in her life. But I guess that’s what happens when you dream, hope and believe in a life and future you were destined to have. Purchased in the early 80’s from a coin shop in one of the buildings of Rockefeller Center. I think it was a gift from dad for her birthday. She always “picked” her gifts. 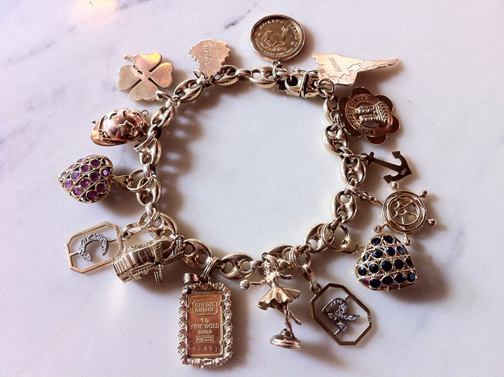 Inspired by mom’s lucky bracelet, I have some charms up my sleeve myself—pun intended. All are available @ my Etsy shop.